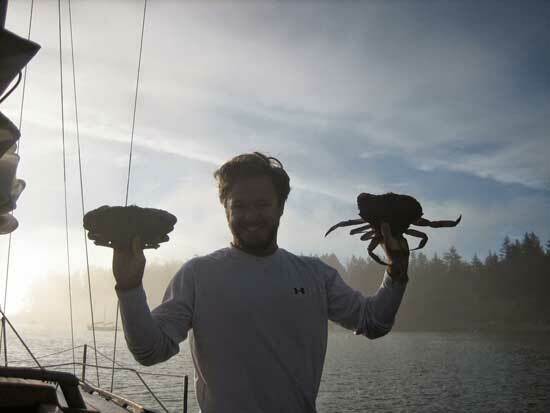 Are you considering sailing Puget Sound? This article provides the cruising distances and travel times between Seattle and the most common harbors in Puget Sound. I learned to sail in the waters around Puget Sound. And in my opinion, of all the cities on the West Coast of the United States of America, Seattle has - far and away - the best cruising grounds for Sailors. There may not be many t-shirt and barefoot sail days. But - throw on a wool sweater and a windbreaker and you are in for a vast inland Sea full of beautiful anchorages and secluded bays. I figured it would be handy to have the distances and travel times between Seattle and all the classic destinations - displayed in one place. I know Seattle sailors like to get out on the weekends, so I hope this is of use. I plotted out these distances based on a direct route, and took an approximate start point for each distance at the outside of each harbor. For the Seattle waypoint, I used the navigation markers just outside the Ballard locks, near the southern end of Shilshole Marina. This is where my boat was docked, so I am partial to Shilshole as a starting point. If you're starting from Elliot Bay, you can add or subtract 5 miles, depending on whether you're heading north or south. Each mariner will experience a slightly different distance, depending on their mooring location and line of sail, but consider these good approximations. Alize' moored right next to the Parliamentary buildings in Victoria - very regal! I have made these routes in my 30 foot sailboat (a 1976 Newport), and I am calling my average speed at about 4.7 nautical miles/hr.. This average speed accounts for some sailing in good to moderate winds and then the engine turned on at moderately high RPM when the wind goes light. For most folks with a sailboat near 30 feet, just under 5 nautical miles/hr. is probably about the right average speed for mixed conditions. It must be mentioned that tides and currents play a large role in the navigation of these waters. The prudent mariner would be wise to consult the tide table and plan out each voyage so that the current is working in their favor as they traverse any narrow channel. Of course, sailors rarely use a completely direct path from one point to another (either due to some tacking or to unintentional meanderings) and so, it would be wise to plan 1 or 2 hours on top of these estimates. And... before you untie the dock lines, make sure you have a cruising guide. Most local boaters prefer the A Cruising Guide to Puget Sound and the San Juan Islands: Olympia to Port Angeles. It's regarded as the authoritative guidebook for the region. And you probably also want the Waggoner guide. The 2016 Waggoner Cruising Guide is updated every year. So, with this on board, you'll have all the latest information/telephone numbers/websites on ports, harbors, marinas and coastal towns. 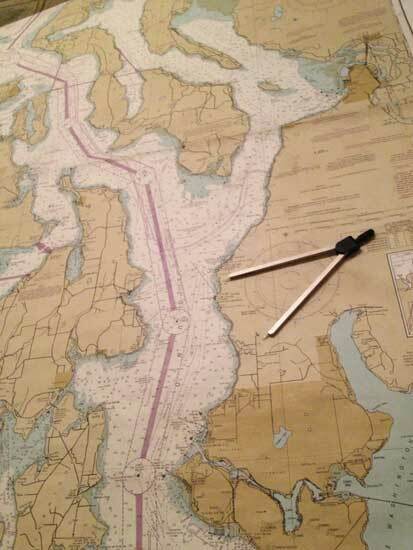 It comes in handy when cruising Puget Sound. Here's a happy memory from years past while I was out sailing Puget Sound. Ok - keep off the rocks, have fun - live to tell the story! Thanks for this numbers! I have had difficulty verifying my own estimates. How long (approximately) does it take to go through the Ballard locks and shipping canal? Can anyone do it or is a permit required? Glad the post helped. No permit required to pass through the locks. You can pass through them in about 30 minutes - usually, unless you're at a high traffic time. To traverse the shipping canal takes longer - most sailboats will need a few bridges opened up to pass under. Give yourself an hour to get from the locks to Lake Union. be sure to make time for a camp fire on James Island. Great spot!Enjoyed your blog.Fair winds. I think you're right - if you rush the trip and jam out a straight line, you've missed the whole point. I almost put James Island on there as a destination point, as that is one of my all time favorite spots. I really miss that area. 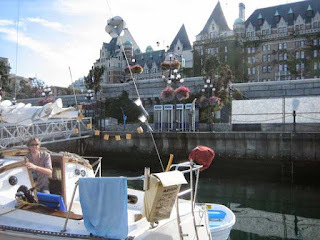 Is it possible to sail From Port Townsend to Newport in a small sail boat? If so how long would that take on average best guess? Sure you can do that. You only want to head south from Seattle to California in the summer though... Low pressure systems can be nasty on the Oregon and Washington coast. In a small boat - I would plan for at least 3 weeks in good weather -- that way you can enjoy the passage. How far is it from Port of Everett to Port Townsend? Bremerton? Which is closest? So... Bremerton is the closest..